The Victoria & Albert Museum is renaming one of its galleries after Sir Elton John following a "significant" donation from the singer. The Rocket Man star and his husband David Furnish pledged the funds to the museum's new photography centre. Its gallery 101 will now be renamed the Sir Elton John and David Furnish Gallery. Sir Elton described it as "the perfect partnership". 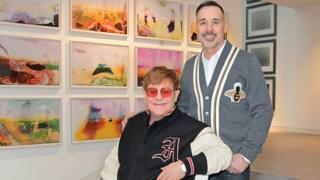 Sir Elton's private photography collection will also go on display. His collection includes images by Man Ray, Dorothea Lange, Andre Kertesz and Edward Steichen, as well as contemporary artists such as Cindy Sherman, Alec Soth and Alex Prager. Sir Elton added: "We are delighted to be part of this exciting moment and we hope that audiences will walk away with the same excitement and appreciation for photography as I did when I first started collecting." Tristram Hunt, director of the V&A, said: "We are immensely grateful to Sir Elton John and David Furnish for their generosity in supporting our photography centre and mission to make historic and contemporary photography available to the widest possible audience." The donation from Sir Elton and Furnish will allow the V&A to showcase highlights from its extensive photography collection with a series of temporary displays, new acquisitions and annual contemporary commissions. The V&A's photography centre opened in October and an extension will be completed in 2022.